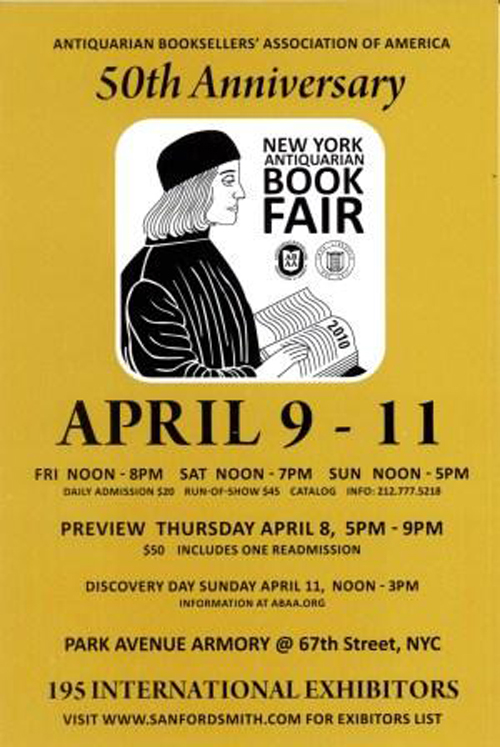 This weekend is the New York Antiquarian Book Fair! I completely lost track of time and forgot that the book fair was coming so soon to the Park Avenue Armory. I have been fortunate enough to attend the last few years and always get excited to see some amazing books from the past. As you can imagine my interests tend toward all things movable so I make sure to make the rounds of my favorite independent booksellers. It is so exciting to actual hold some of the rare Meggendorfer and Kubasta titles found at Aleph-bets Books and Joann Reisler’s booth. Or drool over the glass cases of rare antiquities from Justin G. Shiller. I always find wonderful treasures at Chez Les Libraires Associes where the very pleasant Jacques Desse and Thibaut Brunessaux are on hand to share the latest pop-ups out of Paris alongside rare European titles. And the trip would not be complete without checking out the bookcases of Bromer Booksellers and visiting with Peter at the massive Books of Wonder booth. Below is the essential info for the Book Fair but you can also get a full list of exhibitors and learn more about the 50th Anniversary of the Antiquarian Book Show here. Location: The Park Avenue Armory at 643 Park Avenue and 67th Street in New York. Hours: Friday noon – 8pm, Saturday noon – 7pm and Sunday noon – 5pm. This entry was posted on Thursday, April 8th, 2010 at 8:28 pm	and is filed under Uncategorized. You can follow any responses to this entry through the RSS 2.0 feed. You can leave a response, or trackback from your own site.